18 December 2017 by MilitaryByOwner Advertising Inc. Despite the cliché, but true, gripes about living in the Washington, D.C. greater area, the winter and holiday seasons in the region are truly something to take advantage of while living here. The city is filled with festive events from street markets to spectacular ice shows to entertain your family and those guests who are bound to visit during the holidays. Living in Alexandria, Virginia, is a convenient commute to many of the popular military stations in the National Capital Region, so it’s an ideal location for families to settle while stationed here. The city is large but has a neighborhood feel throughout, especially in Old Town. Old town is a picturesque portion of the city located on the Potomac River and regularly has holiday-centric activities to choose from. On Fridays, Saturdays, and Sundays in December, one of the locals’ favorite destinations is Alexandria’s Holiday Market in The Carlyle District of Old Town. It transforms into a scene of an open air, European styled Christmas market. The vendors rotate throughout the month’s schedule, making multiple trips necessary to catch all of the unique offerings. The spectacularly decorated Gaylord National Resort and Convention Center is bursting with holiday festivities. The Gaylord has its very own agenda of holiday affairs named Christmas on the Potomac that includes gingerbread decorating, ice skating, and a gorgeous indoor light show. Separately, their signature ICE! winter wonderland is home to 5,000 blocks of ice which are sculpted by pros from across the globe. Families can wander through and marvel at the interactive displays. Back on land, George Washington’s beloved Mount Vernon accurately depicts the time period’s most wonderful time of the year throughout the property. The mansion is adorned with Christmas decorations while the walkways are lighted by black iron lanterns for the estate’s annual Mount Vernon by Candlelight event. George Washington was a big fan of camels, so the story goes, so each year, Aladdin the camel comes to visit in a custom created pen of his own for the holidays. Next year, plan to attend two of the city’s most popular events: The Alexandria Holiday Boat Parade of Lights and the Scottish Christmas Walk Weekend. The Scottish parade is filled with Scottie dogs dressed in their finest, not to mention their owners festooned with kilts. Both events are signature to the city and boast a huge turnout. 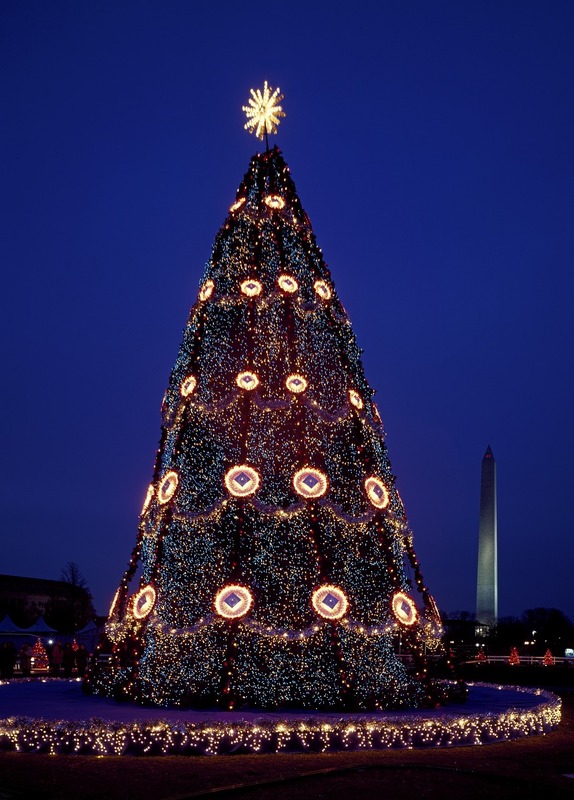 Holiday Activities in Washington, D.C. If you’ve got a DC bucket list like most military families do, then the holiday season is going to be one to get the red pen out and check that list. Start with the lighting of the National Christmas Tree. If you’re not chosen from the lottery held mid-October each year, don’t worry, the tree decorated with ornaments from each state is available for viewing all season long. Night activities such as music concerts are free for the public. Nearby, the National Menorah stands lit throughout Hanukkah. Also, while you’re down there, the U.S. Capitol has its own Christmas tree for citizens to admire. The D.C. Downtown Holiday Market is the city’s best. The list of crafters and vendors is long and varied. Best of all, they change on a regular basis, affording the option to check out the market multiple times and have a different experience each visit. Perfectly located in front of the Smithsonian American Art Museum and the National Portrait Gallery, it’s a double dip for checking bucket list items. The United States Botanic Garden is offering a unique twist to holiday décor this year. Inside, a model train runs through 45 replicas of roadside attractions unique to the U.S. The sculpted plants mimic landmarks like a Coney Island Hot Dog Stand and Cadillac Ranch. Seasonal music is also performed during select Tuesdays and Thursdays throughout the season. The National Zoo hosts Zoo Lights. More than 500,00 lights bedazzle the zoo. Holiday in the Park at Six Flags America. Georgetown GLOW showcases light art at its best and ice skating at the Washington Harbor. Really, this is only a tiny listing of the many options to embrace the holidays and cold in Washington D.C. and Alexandria. To make the most of your time, visit Washington.org and Extraordinary in Alexandria. Because the National Capital Region is such a popular and diverse place for military families, it's important to do the research for homes, schools, and commutes well before arriving. Military Town Advisor has an easy-to-understand PCS Guide for the Washington, D.C. area. Curated from advice and tips from military families on the ground, the suggestions are spot on. You’ll also find reviews for local amenities, housing, and schools. Advertising Homes for Sale or Rent Near US Military Bases In 1999, the owners of MilitaryByOwner Advertising, Inc, David, (USMC,Ret.) and Sharon Gran, were stationed in Germany faced with a move back to the states. This move triggered the idea of linking relocating military families. In 2000, MilitaryByOwner was launched. Our website offers advertisements of homes for sale or rent near US military bases. Our home advertisers connect with other families in need of living near a military base. Our business advertisers provide valuable resources to help make a PCS move a smooth one. We strive to provide superior customer service by being available for questions through our live chat online, email and office hours. The majority of our staff is either military spouses or dependents who can relate to the joy and stress of a military move. Don’t hesitate to contact us by phone, email or live chat! Office: 866-604-9126 9am-5pm EST Email Live Chat 9am-9pm EST Check out MilitaryByOwner on Facebook and on Twitter.